A map is the most basic of user made content you can create. Complex scenarios can be developed on them, or they can be played on their own as simple battlefields with no extra work required. Wesnoth features a fully featured map editor, accessible from the Map Editor option at the main menu. Inside you will find all the tools you need to create your own arenas to stage your adventures. Inside the individual map files themselves are simply terrain codes that the games translates into graphics when you play. Usually you will never have to edit these files manually, but it can come in handy to understand the format. For more on terrain codes and the map data format, see the TerrainCodesWML page. For further instructions on what to do once you have completed your map, see below. As of Wesnoth 1.12, the Map Editor has become more fully featured, and includes options to define scenario-related items on your map, such as name, unit placement, graphical items, time of day schedules, etc. In order to create a plain map file with no scenario data, use the File → Save Map option. Scenario-specific content will not be saved unless you select the File → Save Scenario option. More on scenario-specific content is discussed in BuildingScenarios. When you first open the map editor, you are presented with a large blank canvas covered in Grass. Below is a general guide to turning this empty meadow into an interesting and challenging battlefield. Maps intended to use in a campaign usually portray a location relative to the story being told, while maps intended for use in multiplayer usually have a more "arena-like" quality to them - they're often somewhat symmetrical, feature many types of terrains to benefit all units, and are often in not-rectangle shapes. You can resize your map with the resize function. Choose one proportional to the gameplay you would like to see on it. A close-knit battle arena? Smaller is better. A large epic, battle with many sides? Go larger. Remember, though, to not make it too big, or you will bore your players. Wesnoth includes many different terrains for many different situations. Caves, dungeons, meadows, icy wastes, beautiful fall scenery, etc. 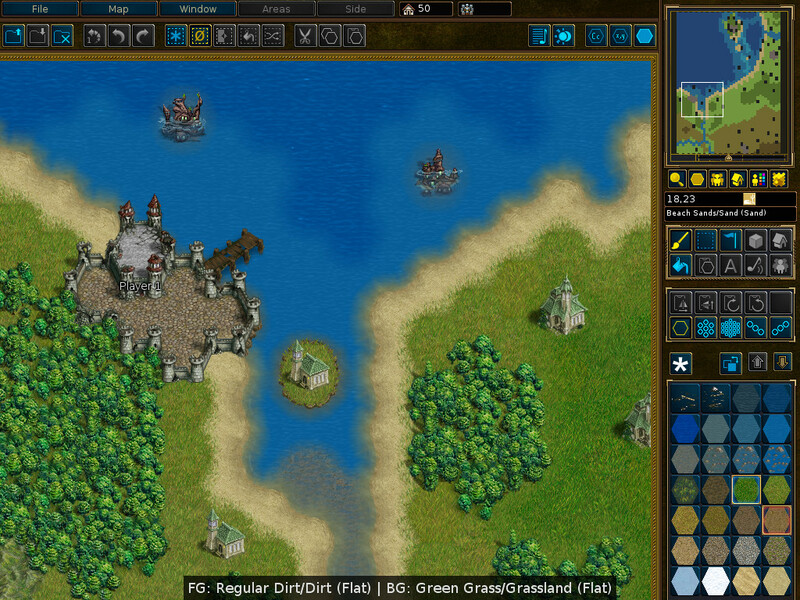 Decide on a general theme for your map and be sure to work with the terrains that best fit your chosen theme. If you were designing an outdoors map, now would be the time to draw large features such as mountain ranges, rivers, etc. On an indoors map, place the walls, design the passages and rooms, etc. It doesn't have to be perfect, just a general outline to work with. Every map needs castles and keeps to recruit on, and roads or flat terrain for units to move on (most units move best on Flat terrain such as roads, grass, or dirt). Add these now, making sure not to make your castles too big or close to one another. The placement of these determines the general flow of your scenario, so choose carefully. Also add villages. These will provide your team income and healing, so don't place them too close to each other (a general rule is about 6 hex radius (at minimum) around each village). Too many close together will result in imbalance from too much gold and health regeneration. Begin filling in the more open spaces of your map. Add forests, trees, hills, dirt, floors, the lot, while at the same time tweaking the general layout to fit your intended design. This is where the map really begins to reach completion. Also note to be sure to draw terrain features in a way that work with your plans for the scenario; for example, be sure to place bridges where you want your units to be able to cross a river. Your map is almost complete, but in order to look polished, throw in a few embellishments. Make the grass different colors. Put rocks and mud in the rivers. Strew trash around your buildings. Scatter flowers in the meadows. It's up to you, just don't overdo it. It can take a lot of practice. Making good, balanced, interesting maps is an art unto itself. ESR has more handy tips in his Campaign Design How-To article. You can also ask for assistance on the Multiplayer Development forum. You've created an awesome map with the map editor, but now what? It's actually quite simple. If you just want to play the map, maybe against the computer or with a friend, all you have to do is save it into the map editor's folder (the default location). Then, when you launch the game and host a multiplayer game, the map should appear at the top of the map choices screen. When creating a game on the multiplayer server, your map will be described to other players as a "User Map" and any replays stored on the server will refer to the game as "User Map." For the curious: Saving a map file like this creates a stand-alone file that holds the map data. That file is by default saved in userdata/editor/maps/, and maps in that location are added to the top of the multiplayer map selection list. If you're interested in more complex gameplay, you can use your map in a scenario. More information on how to proceed is on the BuildingScenarios page. This page was last edited on 24 March 2019, at 14:07.